NFV management and network orchestration (MANO) is important because, unlike previous generations of service provider infrastructure technology, network management is not a loosely coupled, non-real time entity. Without real-time MANO, NFV loses almost all of its agility, operational and cost benefits, reducing NFV to merely a ‘vanilla’ network functions virtualization exercise and exposing carriers to the continued risk of vendor lock-in. NFV MANO as a term was first coined by ETSI and includes three major building blocks: the NFV orchestrator (NFVO), the virtual network function manager (VNFM) and the virtualized infrastructure manager (VIM). Within GlobalData market segmentation, the VIM is covered as part of NFV infrastructure (NFVI). In this NFV MANO competitive landscape assessment, all major vendors from the network, IT and cloud domains vying for a position in this newly created market segment are rated. In this 2017 report, GlobalData Analyst David Snow builds a market assessment of various NFV MANO solutions based on specific, actionable criteria and market drivers for telcos. 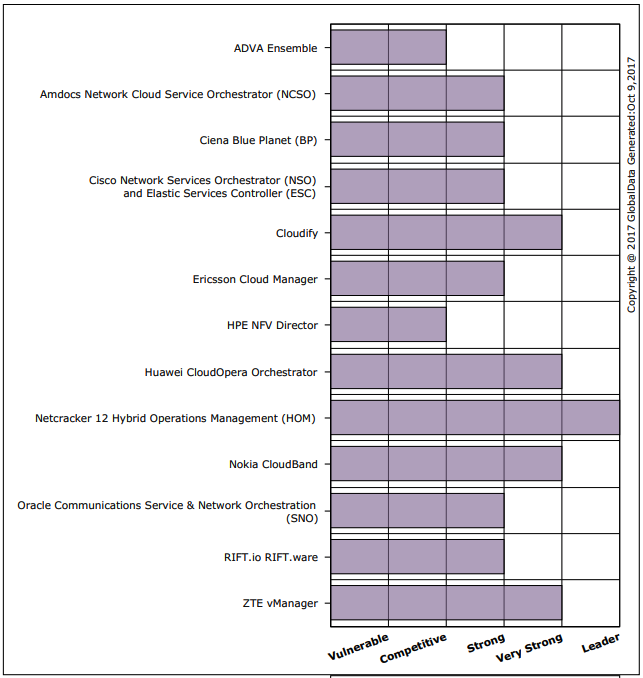 See why Cloudify’s orchestration framework received a “Very Strong” overall rating, including being the top open source orchestrator in terms of production NFV deployments.